Description: Sexes similar. Distinctive head pattern: chestnut ear patches and crown striping bordered in black and white. Mottled brown upperparts; grayish-white underparts marked only with dark central breast spot. Black tail has white corners and outer tail feathers. Juvenile has streaked crown, breast, and sides; lacks head pattern of adult. Behavior: The male sings constantly both day and night, from the ground, a wire, or a fence post. Habitat: Open woodlands, roadsides, farmlands, and native grasslands and weedy fields that are scattered with trees and shrubs. Where in Nebraska: Common spring and fall migrant across the state. Common summer resident in grasslands throughout Nebraska, but especially in Sandhills and Panhandle. 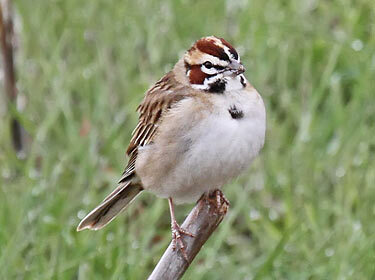 Fun Facts: Walks on the ground rather than hops, like many other sparrows.